3.1 This chapter examines two distinct issues with respect to clinical trials for people with low survival rate (LSR) cancers: barriers to accessing trials and jurisdictional issues for trials. phase 1 clinical trials – as these are primarily focused on defining the toxicity profile of a new treatment, it takes a long time to get sufficient numbers of participants and they are costly and intensive, limiting the number of phase 1 studies that a single institution can open at one time. phase 2 or 3 clinical trials, however, cost limits the number of phase 2 studies that can be run simultaneously at any one institution. compassionate access to new drugs and off‐label treatment. This is common practice in Australia, and while it may produce anecdotal insight into novel therapeutic possibilities, these results are idiosyncratic, ad hoc, unsupervised and unregulated, and mostly go unreported, thus failing to contribute to the body of knowledge. Most importantly, ineffective treatment is likely to be underreported. As governments use information gained from trials when deciding if they will fund a new drug, it is critical that patients with less common cancers have access to clinical trials, and that government, academics, clinicians and the pharmaceutical industry work together to develop trials for these cancers, as well as the more common cancers. Currently, there is a real disconnect between the identification of a new treatment by researchers and, where relevant, access to these treatment options. 3.4 The relationship between clinical trials and the Therapeutic Goods Administration (TGA), the Pharmaceutical Benefits Advisory Committee (PBAC) and the Pharmaceutical Benefits Scheme (PBS), as well as philanthropic and pharmaceutical funding for clinical trials, were examined more generally in chapter 2. 3.5 There are a number of barriers to accessing trials, including the absence of trials for LSR cancers, identifying the availability of trials, meeting the trial criteria and having the physical and financial means to participate in a domestic or international trial. pharmaceutical companies are risk adverse when it comes to initiating adequately sized trials in cancers with low incidence. ...admin did not provide details of the trial; existing treatment timing meant the trial start date was missed by a week; my tumour was in the wrong location; the trial was already full; the trials were not being run in Western Australia; etc, etc. ...these symptoms show the current funding model is based on standard clinical research practices with a limited number of patients able to be involved, and little, if any, data sharing between trials. 3.9 Mr Eliot argued that '[t]his approach is simply not working' and although he acknowledged that '[t]here are valid reasons for clinical standards to be set high, particularly in researching new treatments', he submitted that 'standard, slow, phased clinical trials are not the only way forward' and discussed the GBM AGILE model as an alternative. The Cure Brain Cancer Foundation (CBCF) noted that this particular trial had an 'innovative trial design' and 'an adaptive trial platform, which has great potential to reduce timeline[s] through seamless transition from Phase 2 to Phase 3 within the trial'. Access to this trial is further discussed in chapter 5. 3.10 The following sections examine some barriers to accessing trials that were repeatedly cited during the course of the committee's inquiry. We are looking for news about trials and new drugs that are coming along. There is not that much information about it here in Australia, so we look to Google and we look to proper websites over there to try to find—just some hope, you know? That is what we are looking for, that there might be something. ...come with wads of paper, particularly the relatives of the patient and the children of the patient. The clinicians also have better access [to information about trials] than ever before. ...a patient with a brain cancer will be told they need an operation, they will be told the diagnosis and 'This is what is going to happen to you'. There is very little information given to them up-front and there is certainly no information in almost all circumstances about available trials and what that might have to offer. Often clinicians are not so familiar with these rare cancer types and the trials. So there may well be opportunities for treatments that people are just not aware of both from the clinicians and from the consumers side of it to find the best treatments, or even the clinicians who are in any way familiar with treating these conditions. Often that means travelling to other locations. Again, you have to be wealthy enough to afford to do that because that is not supported. There is the potential for duplication if there is not some register of even the preliminary pilot studies. CHAIR: One of the other things that a number of you have mentioned was clinical trials. I am interested in what sort of information you were given about clinical trials and how much you had to go away and research for yourselves. Mr Shonk: There is virtually none available. They pretty much do not exist. CHAIR: Someone mentioned to me that there are not even any brochures available about brain cancer. Mrs Turpie: Yes. We did not encounter any brochures. We were just sat in a room and told, 'This is a clinical trial that kids with medulloblastoma are on.' To be honest, there was nothing given to us, it was scary and I felt like my son was being used for research himself while he was still living. ...I understand that all the people running the trials are so strapped in even getting their trials up and running and that the administrative support, as I understand, is also a real barrier to people running the trials inside the hospitals and the labs. And that that would be stopping trials getting up and running, I find, gobsmacking. There is a website that I did look at, which did not really lead me anywhere in particular to the possibility of a trial. So it was in fact drawing on the experience of Denis and other people I knew in the brain tumour area, and just saying, 'Who do you think might be running a trial?' Denis said, 'Well, you can call so and so in Melbourne', and I did. After announcements of other initiatives in cancer research in this country, I called and just said who I was. But there was no coordination or leading me in any way that showed me a direction where there could be a trial. So you just cold-call and say who you are and say, 'Can you help?' because it was not available. 3.18 As Mr Todd Harper of the Cancer Council Victoria (CCV) observed, the motivation of cancer patients to seek out the clinical trials available to them 'speaks to the value of having information that is consumer friendly and is able to guide them towards these types of activities'. 3.19 The committee was informed that information about trials is available on the AustralianClinicalTrials.gov.au website, developed by Cancer Australia in partnership with the Australian New Zealand Clinical Trials Registry, the University of Sydney and Cancer Voices. ...the Cancer Australia website supports the only national cancer clinical trials website which gives consumers access to current clinical trials in Australia and to Australian arms of international trials. A particular focus of the website is that it's consumer friendly. So there are consumer lay descriptions of the trials, which obviously help when patients are looking for appropriate trials. There are simple search functions which enable them to navigate through the site and find trials that are eligible. In addition, there's also specific information about the eligibility of the trials and the implications of the trial participation. So the focus of the website is really aimed at trying to encourage participation by making it a very user-friendly experience. As you alluded to, the data for the Australian cancer clinical trials website is sourced from the Australian New Zealand Clinical Trials Registry, the ANZCTR, but also ClinicalTrials.gov, which is the US clinical trials website. It is dependent on the clinical trials being registered, and the responsibility rests with the investigator and sponsor of the clinical trials, so that is potentially a challenge. It is their responsibility to update and provide information on that website. 3.21 Although this description indicates that the website contains a wealth of information about clinical trials, the committee heard that people living with cancer are not accessing this information due to the difficulty they experience navigating the website. I think it is extremely difficult for individual patients to know what clinical trials might be suited to them. In nearly all cases they are going to be relying on their treating doctor to be able to assist them to understand whether they are eligible or not. There are searches that can be done and, if someone perhaps gets really lucky and really knows what they are doing, they might be able to find that information, but most people are going to be relying on their doctors to assist them with that. We have undertaken public polling in the past, where we have asked people about clinical trials: are they aware of them and what they are? Typically, what they are telling us is: 'I rely on my doctor.' That is very much where it is at. I know the last speakers were talking about the difficulty of understanding even the range of clinical trials happening within Victoria. On a global scale, that is enormous, and it is not the patients who are in a position to do that. It really is a matter of ensuring that our researchers and our organisations are connected globally and understand what is happening. ...to work out whether a particular trial is suitable for a particular patient still requires a discussion with their doctor et cetera...while one thing is to be able to find out what trials are available, the other thing is—if the trial is not available at your site, in your city or at your hospital—how can you get access to other places. They are really important issues. ...one needs to know exactly what one is looking for to be able to locate and be included in a trial. When looking for non-government or partially funded trials, one must seek information from the individual groups and their current trials. This haphazard method is not good enough for the individual whose health and wellbeing is already compromised by their cancer. 3.25 Indeed, Ms Susan Pitt also informed the committee that some trials, such as physician-led trials, may not be listed on the website. 3.26 In its submission, the National Health and Medical Research Council (NHMRC) referred to survey results which 'demonstrate that the lack of awareness of relevant trials is a barrier, not just to increased participation, but also to increased cross-referral of patients by general practitioners or clinicians'. developing a national marketing campaign to improve awareness of the website and an understanding of the role and value of clinical trials. Funding for the campaign has been provided by the Department of Industry, Innovation and Science. 3.28 The NHMRC noted that '[i]mprovements in cross-referral rates of GPs and clinicians have also been observed through the use of a Mobile Applications (‘Apps’) - ClinTrials refer'. We can certainly look at different ways of directing people to the website—through social media and some of our existing mechanisms. The consumer organisations, we would anticipate, would do that as well. But, given the comments that you're making, we would certainly be able to have a look at that. The recent website redevelopment was done with patients. We wanted to make sure that the final product was one that was very user friendly. Since the redevelopment of the website we saw in May this year the website attracted 3,130 visits from users, which was a 30 per cent increase from prior to the introduction of the new website. At least on those initial numbers we are very confident that it has responded to the need of cancer patients. I am sure that my Cancer Council colleagues, for whom clinical trials is a priority, would be very happy to work on expanding what was essentially a prototype developed in Victoria and making that available nationally. Obviously, having a site that is already established and has demonstrated feasibility may offer some advantages. ...encouraging clinical trial sites to contribute data. That is done under a funding model in Victoria, as I said. Currently it is about $200,000 in Victoria. Ideally, we would like to increase that in Victoria to make that available or provide a greater incentive for organisations to submit their trial's information. I do not see any reason why that could not be looked at as a prototype that could be rolled out across Australia. My guess is that, if that was done, funding would be between $1 million and $2 million, probably closer to two, to enable incentives for trial sites to submit their data and also to upkeep the website and promote that website. The two principal benefits of that that, I see, are: firstly, to provide access in a form that has been demonstrated to work well with consumers; and secondly, to enable trial sites to use that to recruit patients to their clinical trials. I think that that would be quite a substantial benefit as well. I should also note that the Ian Potter Foundation was very generous in providing us funding to enable the website to be recently redeveloped. 3.34 Many people who have LSR cancers may be ineligible for trials because of their current state of health, prior treatment, or their age. We asked our various specialists in Canberra and in Gosford if there were any trials that were suitable. We were told that there were not. We did research online to see if we could come up with anything, but we found that, once you make particular treatment choices, you are given a particular drug or the tumour recurs, suddenly anything that might have been eligible you are no longer eligible for, because you have already had another drug. So the doors close very quickly once you have made treatment options. With time being such a pressure, you make those treatment decisions as quickly as you can. I looked and I applied but it is all for grade 4 astrocytomas because that is the worst and the deadliest. They are opening all the trials for them, and even at that stage it is not until you are terminal that they really let you in. I am someone who is still relatively early in their diagnosis and who has a few years up their sleeve, and so they will not me let in until I am on my deathbed. My son has already had the gold standard of treatment and radiation a couple of times, so that in itself makes him not applicable for trials. His age as well makes him not eligible for trials. If they know from the start and they have other treatments, as they are calling them, or ones that are yet to be made and they are yet to trial that they can maybe go on this path of this new thing, as opposed to just doing the gold standard of treatment, which then makes them not eligible to do other trials. 3.38 The timeframe within which a person can be eligible to begin a trial can also be quite tenuous. For example, Ms Simone Leyden of the Unicorn Foundation recounted a story of a patient who managed to join to a trial after her oncologist initially informed this patient that no trials were available. Ms Leyden noted that '[i]f she had literally waited another 24 hours, she would not have been eligible for that trial'. I cannot have had this and I cannot have had that to get into the trial. Then, while I am on the trial, I cannot use any other therapy. If I do, my doctor would have to agree to it. The only reason they would stop the trial would be if the trial ends or I get progression, which is going to be picked up on one of the regular scans and then I am bumped out of the trial and we find out which drug I was actually on. That then decides what is next—whether it is chemo next or whether there is actually another targeted therapy that I can try. Yes, there are very strict guidelines for getting in and there are certainly very strict guidelines—you cannot undertake any other treatments while you are on the trial. But it is better than the alternative. Paradoxically, a sponsor’s legitimate aim to reduce confounding factors and thus ensure that a clinical trial produces the highest quality evidence of efficacy, may result in narrow eligibility criteria that significantly lower recruitment. It is not an exclusion by want of exclusion. It is simply that, if you follow the science and you want to make sure you have answered that scientific question of that drug or innovative therapy, you must be quite rigorous around the protocol that you design. By virtue of that, it means you have a certain population to study and study very well so that you get the right answer at the right time and that you are not wasting time as well. ...we have actually designed our modules with exclusion criteria that say: 'The diseases where there are existing trials which people can get access to are excluded from this because there are other trials available. It is the people who do not have the trials available that we are selectively screening.' And we have 170 of those within nine months; we have 600 by the end of this year. There is a huge population that just cannot get access to trials. ...as a general rule, patients from regional centres do miss out, unless they can travel to a major centre. From my knowledge the Canberra Cancer Centre, as an example of a regional centre, has not so far participated in an adult brain tumour clinical trial locally, although some of its patients have – by travelling interstate. Patients from rural and regional areas opt out of trials because of the long distances travelled, the cost of travel and finding accommodation and the rigours of travelling while feeling unwell from their illness or the treatment they are undergoing. 3.45 The committee also heard from numerous witnesses about the variations in survival for people living with cancer in regional and remote areas versus those in metropolitan areas. 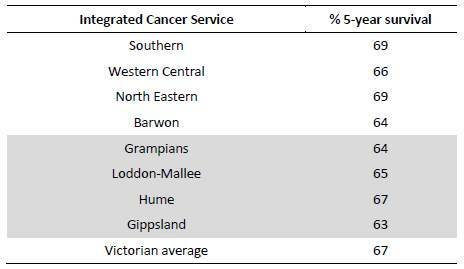 3.46 For example, CCV noted that '65% of people with cancer living regionally survived five years after diagnosis, compared to 69% of people living in a metropolitan Melbourne region', and provided the following table which illustrates the five year survival rate for metropolitan and regional integrated cancer service regions in Victoria, with the regional integrated cancer services highlighted. 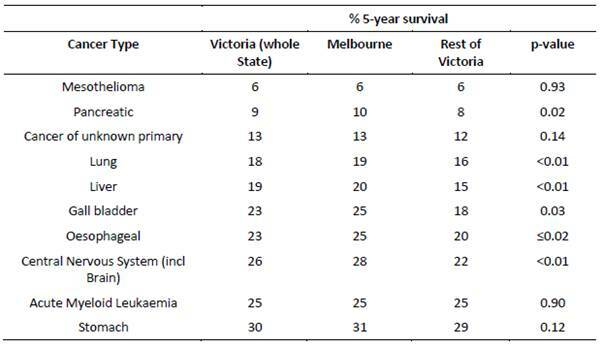 3.47 CCV also provided information about the differences in five-year survival for low survival cancers between metropolitan Melbourne and the rest of Victoria, which illustrates that, in many instances, people with LSR cancers living in regional areas have poorer survival outcomes compared with those in metropolitan areas. Table 6 presents this data over a five-year period. ...a recurring theme in recruiting for clinical trials is that patients from rural and regional areas opt out of trials because of the long distances travelled, the cost of travel and finding accommodation and the rigours of travelling while feeling unwell from their illness or the treatment they are undergoing. The kind of surgeon I am is not a common surgeon, so the practice tends to come to me. I look after people from Launceston, Albury-Wodonga, even Adelaide, Mount Gambier and all of Victoria. If I have a trial on at my institution someone from Mildura or somewhere does not get any reimbursement to turn up for a trial presentation. They can only get what limited funding there is from state governments for assistance for actual clinical presentations only, not for turning up to a trial test. 3.51 The ANZCHOG National Patient and Carer Advisory Group similarly observed that '[w]here a trial is only available interstate, participation requires funding for interstate travel and accommodation', which is 'a huge financial burden for interstate patients', as currently, there is no funding available. 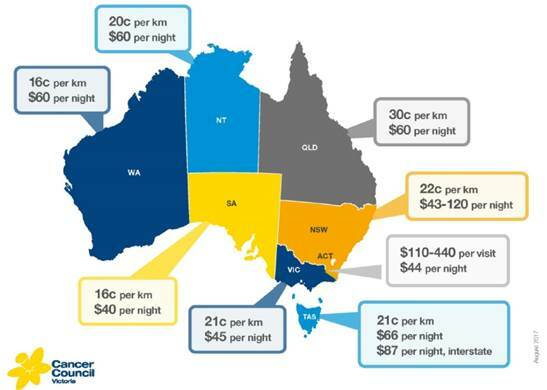 3.52 In his evidence to the committee, Mr Dan Kent of the Australasian Gastro‑Intestinal Trials Group, stated that in New South Wales, 'we get $60 a night to travel to a treating centre, and that really does not cover too much. It would be nice if those costs could be encompassed within trials to get regional, rural and remote people in'. 3.53 In contrast, patients participating in a pharmaceutical clinical trial will generally be reimbursed for travel and other costs associated with attending appointments, unless these patients are on a cooperative group or investigator-initiated (that is, non-commercial) trial. 3.54 In its submission, Ovarian Cancer Australia recommended 'expanding medical travel and accommodation reimbursement schemes to include registered clinical trial participation' in order to 'overcome the reluctance displayed by some rural and regional patients who would otherwise be ideally suited to participate in clinical trials'. Financial assistance to support travel for specialist medical services that are not available locally are offered by state and territory governments and administered through public hospitals. Currently, patients who choose to participate in a clinical trial do not qualify for these schemes. For the patient, this can reduce their available treatment options and for the researcher, it can limit representation of the rural and remote population in their study. The various patient travel subsidy schemes lack flexibility to respond to complex circumstances of individual patients, constrain decision making and segregate eligible patients from participating in clinical trials. Additionally, these programs are under-funded and do not meet the real life costs of travel and accommodation. The schemes do not ensure a patient has equitable access to all treatment options regardless of geographic location, and in the interests of the individual and the public, the Government must encourage participation in clinical trials for all cancer patients regardless of geographic location. 3.56 Further, CCV provided the following figure which illustrates the variation in reimbursement for patient transport assistance across Australia. ...have funded a three-year project to improve cancer patient access to clinical trials conducted at regional centres. This is one of four projects aiming to implement innovative solutions to increasing patient access to cancer clinical trials. It is intended that the learning from these projects will be applied to improve access to trials at other centres. 3.58 Participation in teletrials is another way in which the barriers facing people living with cancer in regional and remote areas may be ameliorated. 3.59 A 'teletrial' encourages the 'accrual of patients to a suitable clinical trial regardless of geography within a state' by the use of technology to reduce the need for patients to travel to institutions where the trial is taking place. Mr Richard Vines of Rare Cancers Australia opined that '[t]eletrials are the only way that people in the regions...are going to get access to state-of-the-art treatment through clinical trials, if we can somehow build a protocol and manage that remotely'. ...outlines the key considerations for increasing access to clinical trials for people with cancer living in rural and remote communities, and facilitate study activity across rural and remote locations...[and] has the potential to connect research centres, and improve the rate of recruitment to highly specialised clinical trials, including low incidence cancers. 3.61 The Walter and Eliza Hall Institute advocated for the support of the Australasian Teletrial Model, which it submitted would 'encourage accrual of patients to a suitable clinical trial regardless of geography within a state'. The model documents a feasible and effective tele-health strategy to increase access to clinical trials closer to home using traditional video-conferencing technology and web based systems. In addition, the model will aid collaboration and networking between centres. This will have a flow on effect for delivering greater engagement in research activity, improving adherence to evidence based practice, improving the rate of recruitment of patients into clinical trials, reducing the disparity in cancer outcomes for geographically dispersed populations, building clinical trial capacity, and providing trial-related training. Since 2011, utilisation of tele-health in the delivery of services has increased. In the first quarter of the 2011/2012 financial year 1,809 claims relating to telehealth services were processed through Medicare compared to 40,570 in the quarter ending 30 June 2016. ...an ‘accredited trial site cluster’ could be a network of institutions identified as having clinical trials capacity as an established multi-centre collaborative. The level of support provided to the smaller sites would be determined by the complexity of the trial and the clinical capabilities at the site. Increased capacity could be provided from the primary site to potential rural and remote locations through tele-trial models and use of e‑technology, such as the Australasian Tele-trial Model. ...patients in Victoria would have access to a trial open in Victoria at the closest comparable hospital. ‘Teleoncology’ models of care offer the opportunity for patients living outside major metropolitan centres to access clinical trials closer to home, reducing the need for travel...While the principles of operation for primary and satellite centres are the same, site-specific governance and processes need to be developed for effective implementation. 3.65 Ovarian Cancer Australia also expressed its support for the model. ...the barriers to running these trials is actually obtaining numbers for rare cancers, and that is a common thing with all rare cancers. But if you could get all the patients with brain cancer in one centre and available for trials then I think that would accelerate improvements in outcomes. I think that is the difference between here and Europe. That is because our population is very small compared to that of North America or the larger European countries. That means that we really cannot run these clinical trials by ourselves in this patient population; we have to be part of these international collaborative groups. The numbers for each of those trials are becoming smaller and smaller as the subgroups that are eligible for those trials get smaller. For example, for a particularly molecularly targeted drug there is only going to be a small percentage of a certain type of tumour that will be eligible for that trial. So international cooperation and collaboration is increasingly important. It was probably five or six years ago that you could look parents in the eye and say, 'There really is nothing else anywhere in the world other than what we can do here.' That is not the case sitting here today. There are treatments available overseas, some of which have very promising results for very high-risk leukaemias that are proving to be very efficacious. For me to send a patient to North America where they could access one of these trials costs close to $500,000 to $700,000 for them to go and enrol on that trial. That is something that parents now in Australia have the knowledge about and have to deal with. I guess those cells are going to come—they are in clinical trials. We need to position ourselves to be an attractive enough partner that we can participate in those clinical trials, not just in those cellular therapies but other new drugs. It is a rapidly moving field. Our model, which has served us very well, has been to put our hand up to be part of these trials and do it on the cost of the smell of an oily rag. And that just does not work for these new trials. We need to work out a way that we can continue to be attractive partners and continue to have early access in the setting of clinical trials for these new and exciting drugs, so that parents do not have to start looking overseas. Senator SMITH: We could run more. Prof. Johns: we could run more. We certainly have the capacity to run more. It is trying to engage with industry in the US and Europe to come and do some trials here, but we could do more. It is difficult. I applied to do a trial through the new innovation grants, and it got knocked back because they did not see enough value for Australia moving forward. So we are trying to do that. There have been times when [the oncologist] has told me that there have been clinical trials running in other countries and they are happy to enrol patients from Australia, but with an international clinical trial, if the principal investigator for that trial is in another country, not in Australia, you are instantly ineligible for government funding. Because a lot of brain cancers, particularly paediatric ones, are so rare, there is not enough of them in Australia to run a meaningful trial at all. The way the funding system is set up literally discriminates against brain cancers and others that are rare. We seem to have a standard treatment here depending on the cancer and then an option of a clinical trial; however, if you look overseas, there are options for treatment. Why are those options not available here? Why are those drugs not available here? Why do we have people here in Australia having to crowdfund huge amounts of money—in the hundreds of thousands of dollars—to be able to go overseas to be given the opportunity to fight for their child's survival? They talk to a doctor here and are told: 'There's nothing more that can be done. Go home and wait for your child to die.' This is heart-rending, this is real and this has been said. 3.73 Following the presentation of the above evidence, on 24 August 2017, the Australian government announced that it will co‑fund, together with the Robert Connor Dawes Foundation, ANZCHOG's AIM BRAIN, 'an international collaborative trial that will enable diagnostic molecular profiling of children with brain cancer'. The duration of the AIM BRAIN is four years, and was accessible from 31 October 2017. 3.74 As discussed in chapter 2, the government also announced on the same date $13 million of funding for competitive research grants from the MRFF 'designed to boost clinical trial registry activity with priority given to under-researched health priorities, such as rare cancers and rare diseases'. 3.75 Further, as discussed in chapter 5, on 29 October 2017, the Australian government announced the Australian Brain Cancer Mission, a $100 million fund to defeat brain cancer. 3.76 The following figure illustrates the number of total oncology trials which started between 2007 to 2016, across Australia, China, the US, the United Kingdom (UK), Canada and South Korea. Secondly, CFDA is actively accelerating the review of Clinical Trial Applications (CTA) and in the last 24 months the number of approvals has increased from 687 (in 2014) to 3666 (in 2016). This is a five-fold increase in just two (2) years across all therapeutic areas; we estimate about half of these approvals are in oncology. ...China will start to run more clinical trials as part of global trial programs and that it will recruit quickly. For innovator medicines companies, which must make decisions about where to place trials in the global setting, this means that trials will most likely begin to move from slower and/or more costly markets, to China. ...other countries that have entered into the clinical trial competition, such as China, started off at a lower base than Australia and have rapidly met and now exceed Australia's standards. Australian standards have more or less stagnated; we have relied on our quality and we have not improved our costs and time for setting up and initiating clinical trials. These other countries have; they have addressed the issues and then exceeded Australia's benchmark. 3.80 Medicines Australia submitted that the way to overcome these issues would be to establish 'an Australian Office of Clinical Trials to enable a national central point of contact to help drive harmonization and quality standards across the clinical trials sector'. 3.81 Regulatory improvements to clinical trials are discussed later in this chapter. 3.82 The committee is concerned by the barriers to accessing clinical trials faced by people with LSR cancers, which appear to be more significant for young people and people in regional and remote Australia. The particular challenges for young people with LSR cancers are explored in the following chapter. 3.83 The committee is concerned that there is inconsistency in the availability of trial information for patients through their GPs, and that patients often resort to "Dr Google" to locate information about clinical trials. The committee does not discourage patients from researching possible treatments for their disease, but considers that more could be done to promote the availability of clinical trial information amongst GPs and the public more broadly. The committee notes that, in its evidence to the committee, Cancer Australia conceded that such improvements could be made. Further discussion about how to increase the awareness of GPs and the public of LSR cancers appears in chapter 5. 3.84 The Australian government website, AustralianClinicalTrials.gov.au, has the potential to be a valuable resource to LSR patients and their families. However, the committee has heard that the website is complex and difficult to navigate, requiring those searching to be familiar with precise diagnoses and medical terms. The committee believes that improvements should be made to the Australian clinical trials site so that is a resource and not a further barrier to accessing trials. The CCV's clinical trial website, VCTL, which allows the user to search by cancer type, trial type, phase, molecular target and hospital, and filter results by gender, age, diagnosis, surgical and medical treatment(s) already received, is a much more user-friendly and accessible format. It also provides pop up explanations of medical terms and phrases. In improving the Australian clinical trials website, the Australian government should look to the VCTL as an example. 3.86 The committee appreciates that traditional clinical trial design deliberately excludes certain patients so that results are rigorous and replicable. However, patients with LSR cancers are not your "usual" patients and maintaining the status quo is unacceptable, it is simply hindering progress towards potential treatments and improvements in survival rates. Innovative trial designs must be devised and allowed, with appropriate regulation, to be pursued. The committee welcomes the approach taken by Professor Thomas of the Garvan Institute; the committee encourages more researchers to follow this approach where an exclusion criterion is the availability of other trials. 3.87 While it is not appropriate for the committee or the Australian government to dictate to researchers their scientific methods and protocols, the committee expects that the Australian government will address regulatory barriers which limit the availability of clinical trials for LSR cancer patients. Regulatory barriers are addressed in detail in the following sections of this chapter. 3.88 The committee is also deeply concerned by the difference in access to clinical trials for people with LSR cancer living in regional and remote Australia, in comparison with people living in metropolitan areas. This is particularly egregious given LSR cancer patients in regional and remote areas suffer worse five year survival rates than their metropolitan counterparts. 3.89 The committee welcomes the Australian Teletrial Model and the national implementation guide issued by COSA. Teletrials will continue to play an important and hopefully greater role in facilitating access to clinical trials by LSR cancer patients in regional and remote areas. However, the committee is of the view that LSR cancer patients in regional and remote Australia must be assisted to participate in person in clinical trials. 3.90 The inability of LSR cancer patients participating in clinical trials to access state and territory patient travel subsidy schemes, and the inconsistency in the subsidies provided, are further barriers to greater participation in clinical trials. The committee urges state and territory governments to consider allowing patients participating in clinical trials to access patient travel subsidy schemes and to agree on consistent subsidy rates based on the distance and method of travel, and the average cost of accommodation in the city in which patients are participating in the trial. 3.92 Finally, in respect of international trials, the committee welcomes the participation of Australian people with LSR cancers in international clinical trials, and is encouraged by evidence received about the number of participants in such trials. The committee acknowledges that not only does this have a significant impact for the individual involved in the trials, but it may also lead to ground breaking advances for people with LSR cancers. However, participation in international trials often comes at great cost to the patient and the committee considers that more could be done to reduce the financial barriers to accessing international trials for all LSR cancers. The committee would also like to see the inclusion of Australian trial sites in collaborative international trials increase. 3.94 A number of submitters and witnesses raised regulatory issues that impede access to trials for patients with LSR cancers. 3.95 For example, Mr Peter Orchard of CanTeen Australia observed that the research being undertaken by individual states and individual hospitals 'is not always well coordinated and not well shared', and therefore advocated for 'a national direction to be laid out and national strategies to be laid down and have funding attached to them, to try and drive changes in behaviour to a more nationally coordinated approach'. We would submit an application. It would go to a body based in Canberra that would consider it. It would take a long time for us to get comments back. We would get those comments. We would need to address them. Then there would be another long period. The regulatory process often involves long periods of waiting, during which time you could work on certain things in the laboratory. You can certainly get things ready but you cannot treat a patient. That is an issue that affects clinical trials but also other kinds of research. issues with respect to insurance. 3.98 Although it acknowledged that 'some changes have been made to streamline ethics approval processes in Australia' for clinical trial processes, the Children's Hospital Foundation and Australian Centre for Health Services Innovation noted that 'governance approval processes remain largely unchanged'. Prior to conducting a clinical trial in Australia, it is necessary to obtain approval from a Human Research Ethics Committee (HREC) to ensure that the proposed research will be undertaken in compliance with the National Statement on Ethical Conduct in Human Research (2007). After obtaining HREC approval, it is a requirement in most Australian public hospitals and research institutes to obtain governance approval. Governance approval is based primarily on resourcing, budget, legal, contractual, insurance and indemnity issues, and provides approval to conduct the clinical trial under the auspices of the institution. Delays in obtaining governance approval of over a year or more have been reported and primarily result from lack of clarity, consistency and transparency of governance processes. These avoidable delays in ethical and governance approvals are themselves unethical. In addition, most institutions choose to wait until ethics approval is granted before commencing governance review. It is essential that the role of the research governance office in an institution be clearly defined and adequately resourced to ensure that approvals can be issued in a timely manner and patients have access to much needed treatment. Furthermore, it is important that research institutions take responsibility for appropriate training and coordination of ethics and governance submission/re-submission processes including provision of resources that appropriately support the investigators wishing to undertake research. The fact that you have to go and repeat ethics approvals in multiple settings and get governance approval in multiple settings can really slow down the rollout of a trial, and then, if we are talking about international competitiveness, it does not make us internationally competitive with the other research markets around the world. 3.102 Speaking of her personal experience with the clinical trial process, Mrs Carly Gray, whose young son passed away as a result of a diffuse intrinsic pontine glioma (DIPG), called for a national network of trials across jurisdictions and collaboration between hospitals and research institutions, asserting that '[p]atients cannot afford to wait for trials to begin'. The operation of ethics committees and the approval, conduct and monitoring of research are the responsibility of the states and territories that apply both national and state specific guidelines and legislation. The authorisation of human research at a particular institution (e.g. hospital or university) and the conduct of that research by a researcher or health practitioner are subject to a variety of national, state and territory laws and policies. 3.105 This variance in laws and policies across jurisdictions was discussed by a variety of submitters and witnesses, who noted a lack of consistency between states and territories with respect to clinical trials. Physicians need to have that real-time ability to find out where trials are happening for their patients sitting there right in front of them today. But, because it is fragmented across institutions and jurisdictions, it is very difficult for them to do that, and, because of the way that our primary care and our tertiary care operate, they do not have the time to dedicate to searching for those things. 3.108 The NHMRC outlined the work it has undertaken to streamline clinical trials: between 2013 and June 2017, $6.3 million was provided to the NHMRC under two budget measures, Expediting Clinical Trial Reform in Australia and Simplified and Consistent Health and Medical Research, 'to develop a nationally consistent approach to clinical trials, improve efficiency and streamline administration and costs with the aim of positioning Australia as a world leader in clinical research'. 3.109 A key outcome resulting from this funding was a National Good Practice Process, piloted at 16 clinical trial sites across all Australian jurisdictions except the Northern Territory, and intended to streamline clinical trial site assessment and authorisation phases. 3.110 As part of its work streamlining clinical trials, the NHMRC also noted that it launched AustralianClinicalTrials.gov.au in 2012, in conjunction with the Department of Innovation, Industry and Science. 3.111 In examining some of these measures, the CCA and COSA commented that '[c]urrent governance and ethics requirements are administratively burdensome and resource intensive, and take considerable time to satisfy'. It was submitted that the structural barriers to conducting clinical trials—which the CCA and COSA consider the 'greatest obstacles to conducting clinical trials in low incidence and low survival cancers', rather than lack of funding—could be overcome by '[i]mplementing systematic changes to improve collaboration will support the sustainability of the cancer research sector and translation of outcomes into practice'. Governance approval by institutions is often delayed due to inconsistent requirements, based on a poor understanding of essential and non-essential steps. These issues are compounded for rarer cancers where the need to find patients and the lack of treatment centres with expertise may mean ethics and governance delays have a greater impact. The need for reform has been recognised by many reviews and government committees, including the 2013 McKeon Review of medical research. The Government has committed to addressing competitiveness through an election announcement of $7 million to improve access to clinical trials in Australia and through the [Council of Australian Governments] Health Council. Roche supports urgent action to position Australia as an international research partner of choice. 3.113 Roche therefore recommended that the Australian government '[i]mplement regulatory reforms in partnership with state and territory governments to streamline the clinical trials approval processes'. The time spent obtaining multiple ethical approvals in order to put Australian patients with the same disease on the same trial in different states causes critical delays, with impact on patients’ opportunities to receive treatment. Harmonisation of human research ethics committees at a national level should be facilitated. Similarly, governance needs to be streamlined. the Human Research Ethics Application: this replaces the National Ethics Application Form (NEAF), and aims 'to facilitate efficient and effective ethics review for research involving humans (i.e. not limited to clinical trials). It was adopted by the IT platform currently used by the health systems in New South Wales, Victoria, South Australia and the Australian Capital Territory 'for the management of ethics review and site approval and authorisation'; however, 'timelines for ethics approval may still vary both within and between the public and private health sectors'. These are all core templates, so we do not really understand why the institutions are spending so much time negotiating on these issues. But I think, simply, if we could fix that aspect, and then we could perhaps use the national office to promote more of this mutual acceptance. We already have it in place. We just need to have it at the federal level. So it would be great to get support from this inquiry to be able to move that forward. 3.117 The differences between states and territories in respect of ethics approval and conducting clinical trials also arise in respect of public versus private hospitals. A NEAF...has about 61 pages where you answer a lot of questions and upload documents about the research, and then, for each hospital site that you want access to, you then have to do another application, which is then looked at by each hospital's ethics committee. Once it is approved there, it then goes to the governance committee. The problem arises if you have not filled something out correctly. At one point I had the wrong number on a page. They do not tell you that; they just put it on hold and then when they finally get back to you have to resubmit it again, but you have missed the next deadline for the ethics committee, so then it gets held over again and then, if it gets to governance, and they do not like the paperwork, it gets held up again. That is before you even start the research. ...in the private sector there is more of a focus on clinician research. In the public sector they are too busy and there are too many people involved from start to finish. Sometimes, the clinician who is doing the care will not even know that they have gone on to have treatment because it is just such a busy, fast-paced scenario. There is little to almost no incentive for private facilities or clinicians to have their patients participate in clinical trials. This impacts adversely on the rate of patient accrual to clinical trials. The second point is that, additionally, there is no incentive or support from private health insurers to have their patients participate in clinical trial research—it is simply not there. One could argue that it is even a greater priority for the private sector to participate and champion research that inevitably will have the potential to bring about healthcare efficiencies and cost savings. It is quite clear that to be involved in a clinical trial requires extra care, extra time, extra resources and therefore extra costs. Clearly that affects issues around reimbursement, whether that is through private or government. Ultimately, to participate in clinical research, the patient, the doctor, the sponsor of the trial and our health system are invested, and it is a question of whether they are clear about that and whether there is an alignment of purpose. 3.122 The ALLG suggested that the way in which to overcome the obstacle that clinicians are time poor, which can impact matters such as timely access to information about clinical trials, could be to encourage models that encourage public/ private partnerships. The ALLG also recommended enabling collaboration between public and private institutions by engaging with insurance companies and the private health care sector, and implementing 'national clinical trial uptake across public and private hospitals' as ways to improve survival rates by establishing Key Performance Indicators (KPIs) for hospitals regarding clinical trial participation, their uptake of patients to clinical trials, and creating 'a culture of positive benefit'. ...operate across multiple hospital boundaries (including across local health districts, public and private hospitals and adult and paediatric settings), assure rapid trial initiation, consistent, cost effective and timely ethics, governance and other relevant approvals, rapid and targeted access to patients and consistent monitoring processes and standards. ... in terms of insurance: again, could there be a national insurance scheme that covers trials so that we do not have this business of every hospital having to go to see whether their particular insurer will cover them for this trial? Just in terms of that insurance process alone: that gets replicated in every hospital, let alone them needing to ask about the impacts on their staffing or their budget. It is an understandable process that they have to do, but to take four or five months for it is the part that does not seem to be valid, really. If we are really keen about getting patients into trials quickly and getting good research happening, we need to make those times shorter. 3.125 In response to this suggestion, Professor Anne Kelso of the NHMRC stated that it was outside of the NHMRC's remit to do such work, and that 'unless we were tasked and funded to do a particular project; it's otherwise not within the remit of NHMRC's activities'. 3.126 While there have been recent changes to improve streamlining of clinical trial ethics approval, the evidence presented to the committee indicates that differences in ethics and governance approval processes between states and territories, and private and public hospitals continue to delay and in some instances discourage trials or trials across multiple sites. 3.127 The committee welcomes suggestions from various submitters and witnesses, such as removing the requirement to obtain ethics and governance approval for each individual trial site; the establishment of an Australian Office of Clinical Trials to be a national coordination unit and national central point of contact to help drive harmonization and quality standards; further regulatory reforms to streamline approvals processes; and facilitating better collaboration between private and public institutions. 3.128 The committee recommends that Australian governments address the remaining barriers arising from differences in ethics and governance approval processes as a matter of priority, and in doing so give serious consideration to the proposals recommended to this inquiry. 3.130 Further, the committee acknowledges the work that the NHMRC has done to reduce unnecessary regulatory barriers with respect to ethics processes, and while it recognises that some processes are beyond the scope of the NHMRC, the committee considers that the NHMRC could make further changes in order to eliminate those existing, significant regulatory delays. 3.131 Specifically, the committee considers that the NHMRC could develop a standard template and associated guidelines, including timeframes, for ethics and other governance approvals that could be adopted by every state and territory. This in turn could allow for the approval from one institution to lead to automatic approval at any other institution.